Intellitec's Light Dimmer offers the RV owner the convenience of dimming the interior lights from full brilliance to a more comfortable level for watching television or entertaining guests. 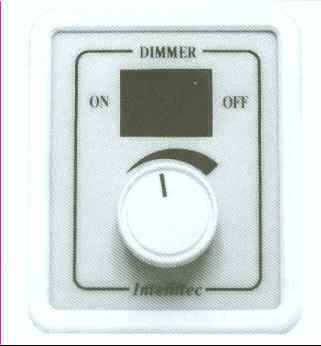 The unit allows dimming of incandescent lights from full brilliance to complete darkness with the turn of a knob. It also has a push button switch that provides a push-on/push-off function so that the light level need not be changed. The unit will handle up to 6.5 amps of incandescent lamps. It is a two terminal controller that wires in series with the light. It can be wired either in the high side or low side of the circuit.